stacked cake | Tiffany Loves Cake! 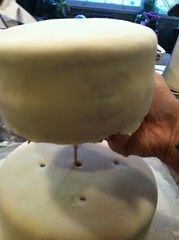 People ask me all the time what they need to do to ensure the integrity of their tiered cakes. 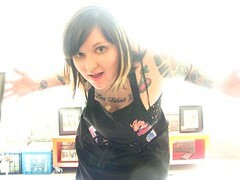 I’ll show you how I do it. 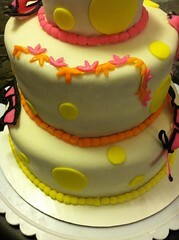 First I cover my cakes with fondant. 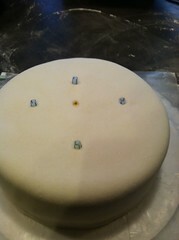 This is a bit more tricky with buttercream covered cakes… but I do most of my cakes in fondant. The bottom cake is given a support system. Honestly, drinking straws work awesome. I find the center of my cake and come out a couple of inches in each direction and insert a straw. 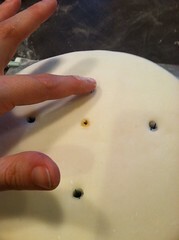 Be careful not to put the supports out further than the next cake with overlap. 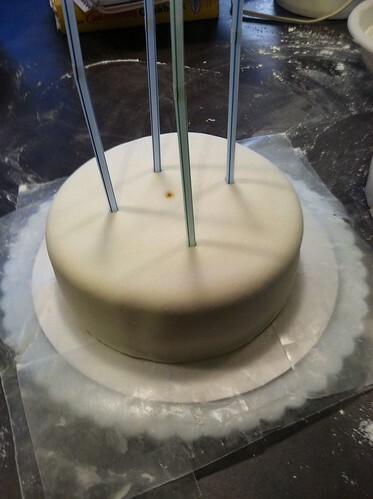 Pull the straws up a tiny bit and cut each one so that once you push it back into the cake, it’s level with the cake and rests on the bottom of the cake board. The concept here is that the next cake’s weight will be supported completely by these straws and it won’t crush this cake. Now, sometimes when I do a tiered cake, I’ll add a center support to keep the cake from falling over or sliding around, coming off center etc. I usually use a wooden skewer in this case. 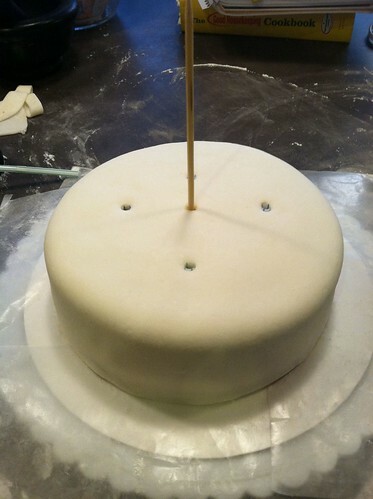 Be sure that your skewer is cut to the correct height, you don’t want it tearing through the top of your top tier. That would be bad! 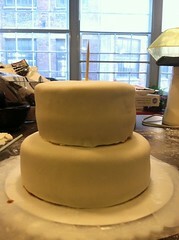 This cake is going to be a three tier. If not, you won’t be able to properly do this. I added a third tier on top of this, putting supports in this second tier the same way as on the bottom. Once you get the cake on, it might look a little rough from the handling, but you just need to wiggle things around a little and smooth things down a little and hey, decorating cakes is all about covering up imperfections with awesome little things you create. 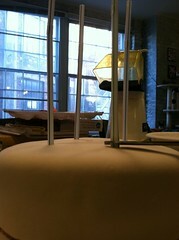 Here’s a photo of it with the top tier on.